So my plan, someday, is to build the Trumpeter Hornet and 1/48 F4F, TBD, SBD, and B-25 to go with it. Try as I might, however, I can't tell if Hornet's aircraft still had the Air Group designator (8-) still painted on them at the time of the Doolittle raid. I can find out what the regulations said, but I know damn well that in April of 1942 the regs were honored more in the breach. I know this is not CAG 8 of the Hornet, but there are photos of Enterprise aircraft while she was with the Hornet on the Tokyo Raid mission marked as above. It is a good assumption that the Hornet's aircraft, with the possible exception of Torpedo 8, which may well have retained the old markings 8-T-1, 8-T-2, etc. for some reason, were marked like the Big "E"'s. I agree with Ernest above somewhat, but to add to that, I think the ill-fated TBFs of Torpedo 8 (which were new aircraft at the time) were marked with the 8-T-* designation when they flew out of Midway in May 1942, so it's a safe bet the SBDs, TBDs and F4Fs were also marked 8-*-* during the April Doolittle raid. The guy who would know definitely is Tracy White-- you might drop him a note over at Model Shipwrights. My dad was a plankholder of Torpedo 9 on the USS Essex (DEC 31st '42). He told me aviation markings could be as individual as the ships they were assigned to in 1942-43, with even the new Essex receiving aircraft with old markings that had been applied at the factory in '42 era standards, to be corrected in the individual ship hanger bays as time permitted. I agree with Ernest and the attached photo supports (at least part) of what he's saying. 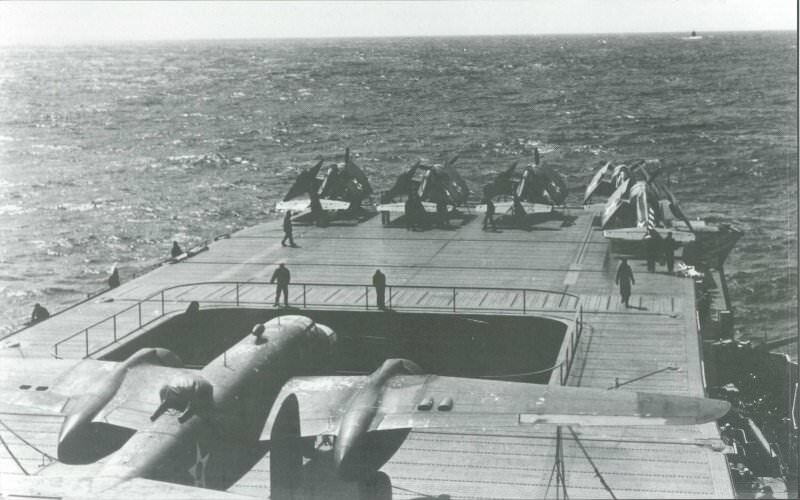 While it's not very clear, and doesn't show the A/C numbers, this shot taken while underway on the Doolittle Raid shows 5 Wildcats spotted on the flight deck in front of the lowered elevator. If you look closely you can see the red and white stripes on the rudder and it appears that there is still a red dot centered in the stars shown on the undersides of the folded wings. There are also some painting references which I believe may come from one of the kits (and yeah we all know you have to take those with a grain of salt) that indicate the same thing, and that by Midway the red dots and red and white stripes had been removed. Thanks everyone! I know about the national insignia and rudder stripes, just not sure about the air group designation. The regulation to remove it wasn't issued until the end of April and Hornet was brand new to the theater, so I'm betting it was still there during the raid. Might take Russ' advice and contact Tracy White.